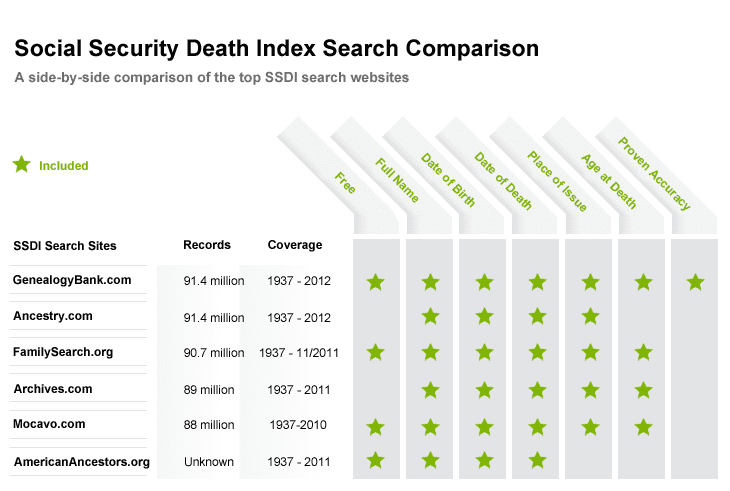 The Social Security Death Index is available on so many genealogy sites—are they all alike? You might think so—but on looking closer, they aren’t all the same. In fact, there are many differences in the Social Security information they provide, as this article will show. Here’s an important question to ask when comparing various genealogy websites: how many SSDI records are on each site? GenealogyBank and Ancestry update their SSDI records every week and have 91.4 million records. In contrast, FamilySearch.org has 90.7 million SSDI records and Mocavo has only 88 million SSDI records. So—just in numbers of Social Security records available—you can miss millions of records depending on which genealogy website you visit. Let’s look deeper and see what information is in the SSDI record on each site. 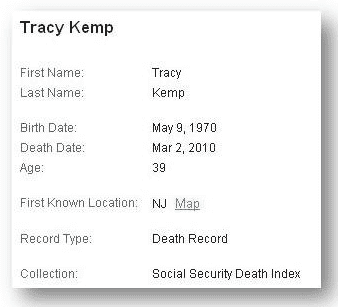 For this Social Security record comparison we’ll use Tracy Kemp as our target person, who died in 2010. GenealogyBank gives his name and tells us that the Social Security card was issued in New Jersey. Importantly, the record also gives complete dates of birth and death, adding the day of the week. The Social Security record also gives a complete and accurate age at death, giving the age in years, months and days. GenealogyBank also includes the extra information that the Social Security Administration has validated this information, giving it the “Proven” designation—telling genealogists that it is accurate information. Ancestry gives the basic facts in the Social Security record: first name, last name; birth date; death date; noting that the Social Security card was issued in New Jersey in 1979. Archives.com gives his name, birth and death dates, and notes that the Social Security card was issued in New Jersey in the online SS record. 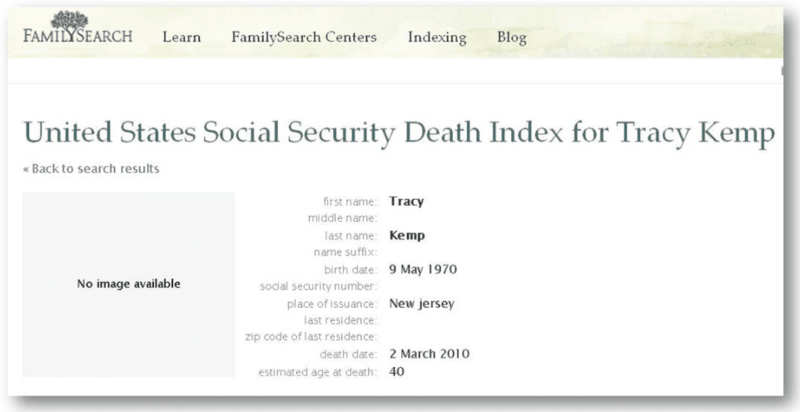 The Social Security death record also adds that he was age 39 when he died. The FamilySearch website repeats this same basic information in the SS record: his name, dates of birth/death, and place of issue of the Social Security card are all the same. FamilySearch incorrectly gives his “estimated” age at death as 40. 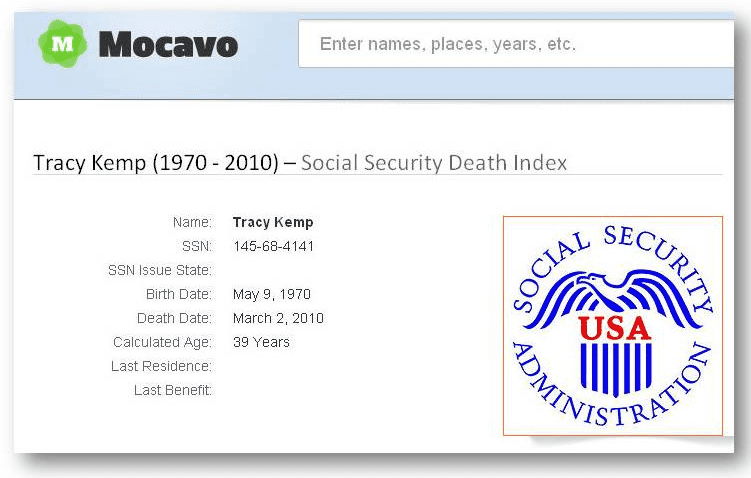 Mocavo gives the core facts in the SS record: name, dates of birth/death, and gives the age at death as 39 years old. This site gives the Social Security number. The other sites have all removed the SSN for security concerns. Mocavo has no SSDI records for 2011 or 2012. AmericanAncestors.org gives the first name, last name; birth date; death date and Social Security number. It has records from 1937 to 2011. It is quickly apparent that all SSDI sites do not contain the same number of records or display the same amount of information. Clearly GenealogyBank.com has the edge, offering the most complete and accurate SSDI information available online. New Titles Coming to Our U.S. Newspaper Archives Soon! that's info the basics of which I can get at Ancestry, my primary paid site. OTOH I paid for a year of GB and found it worthless. Apparently they have very little content relative to th deep south since people I know who search Illinois and Indiana seem to occasionally find something. You need to drop the yearly fee and go to PPV. This is not an apples to apples comparison, exactly. The "free" details that you show for the search results with Mocavo and GenealogyBank require the user to register to see the details to the degree you present here. But, that done, the accuracy, freshness of the data and detail does matter. However, you didn't include the site (http://www.americanancestors.org) that provides all that GenealogyBank does, and more, for free, no registration. That site also includes the SSN, which is critical when I'm confirming an identity to determine pension beneficiaries, estate heirs and loan forgiveness for financial institutions. Hi Tamara. Thanks so much for your feedback regarding our recent SSDI search comparison blog post! We updated our SSDI website comparison to include AmericanAncestors.org. 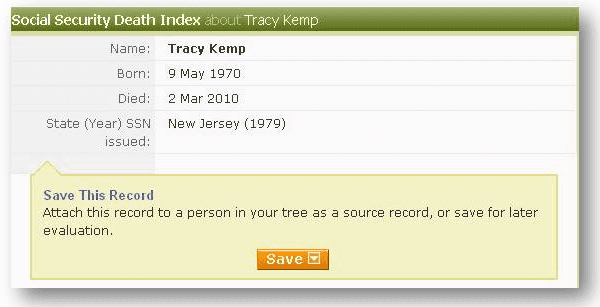 One of the nice things about GenealogyBank is that it adds more records so fast. It adds records at the rate of 10 new records a second – that's a lot of records. In another week we'll be at 1.16 billion records which is 1 billion more than when we launched – 5 years ago. So – if you didn't find what you wanted the last time you checked – dig in again and see what you find this time. Recently I decided to just see what I could find in GenealogyBank with all this added material—so I chose a family at random and set out on a genealogical research investigation. I picked Minnie M. Damon who married James W. Wright on 31 December 1890 in Keene, New Hampshire. I found so much – I was really pleasantly surprised – so I wrote about it here: https://blog.genealogybank.com/2012/03/how-to-do-genealogical-research-damon-family-case-study.html. Another good SSDI search strategy is to search on the first name. Often families passed down a mother or grandmother's surname – preserving it in family memory by giving it to a child as a first name. Give that a try. Search only the first name and see what you find. Another handy feature in GenealogyBank is that it links the SSDI to obituaries in our almost 6,000 newspapers. 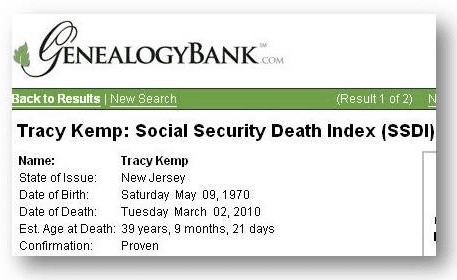 For example – in today's test SSDI search – you can read Tracy Kemp's obituary here: https://www.genealogybank.com/gbnk/obituaries/doc/obit/v1:133060091A82E550-13306009252F1AA0?&s_dlid=DL0112032403441302688&s_ecproduct=SUB-FREE&s_ecprodtype=INSTANT&s_trackval=&s_siteloc=&s_referrer=&s_subterm=Subscription%20until%3A%2012%2F14%2F2015%2011%3A59%20PM&s_docsbal=%20&s_subexpires=12%2F14%2F2015%2011%3A59%20PM&s_docstart=&s_docsleft=&s_docsread=&s_username=newsbank&s_accountid=AC0106092012243115568&s_upgradeable=no. And, as to the comments on the blog, you would say?